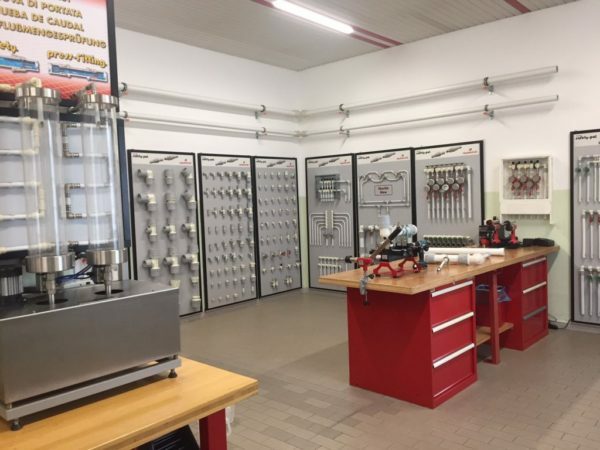 Smith Brothers Stores, invited customers, specifiers and consultants across to the production facility of Aquatechnik in Milan, Italy earlier this year in June. This allows our customers to understand and learn more about the Aquatechnik Safety Multilayer Pipe System, as the products are exclusive to Smith Brothers in the UK. Attendees included customers from our midlands branches including Birmingham and Leicester branches and three of our newest members of staff at SBS. Colin Milton (Cardiff), Nathan Kinnear (Leicester) and Jordan Coulson (Newcastle). The first day, consisted of an in depth technical seminar in which a member of staff at Aquatechnik presented the product. The representative went into depth about the features and benefits of using the Safety Multilayer Pipe System. The presentation included a demonstration of Aquatechnik’s unique flared jointing system, that provides a simple, yet secure, installation method for multi-layer pipes. Day 2 consisted of a tour of the factory, which included the production of the products. This permitted the customers to see the precision that is included with the process of how the Multilayer Pipe System is made. After, a practical session happened to teach the attendees the correct assembly and installation procedures of the product. Along with the factory visit, the customers and members of staff were able to socialise in the evening, by enjoying an evening meal at the side of Lake Maggiore, Arona. Following the trip, Envirotech, has successfully installed the product at Dallas Burton Polo Club on a Mitsubishi Electric Hybrid URF system.